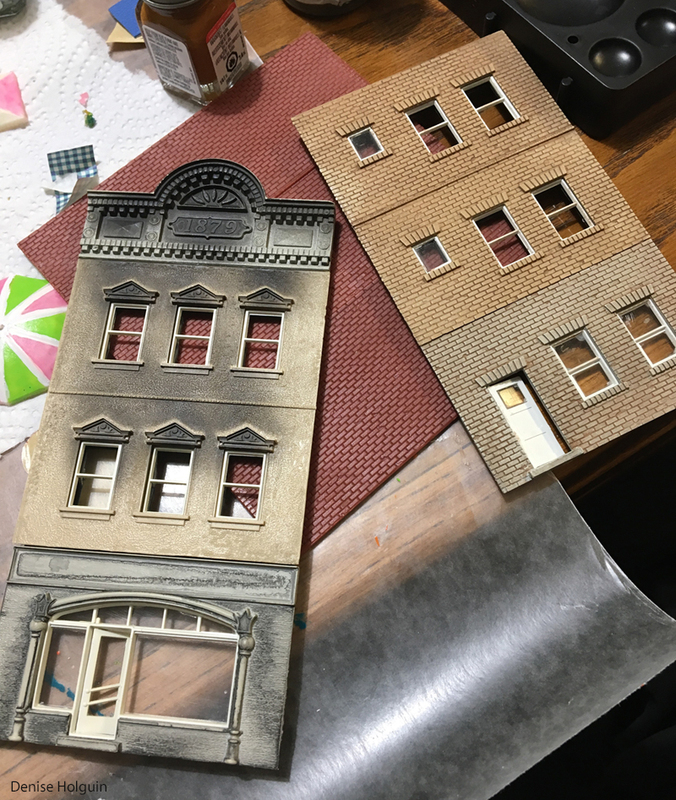 I didn’t know I had skills or interest in making HO scale model buildings. 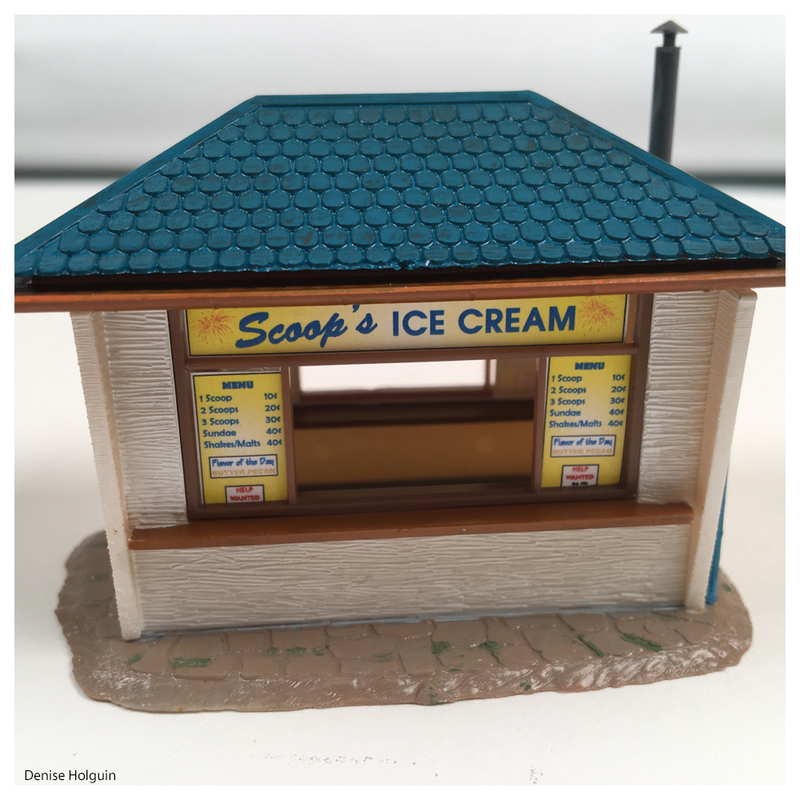 I started with an inexpensive kit to make kiosks. 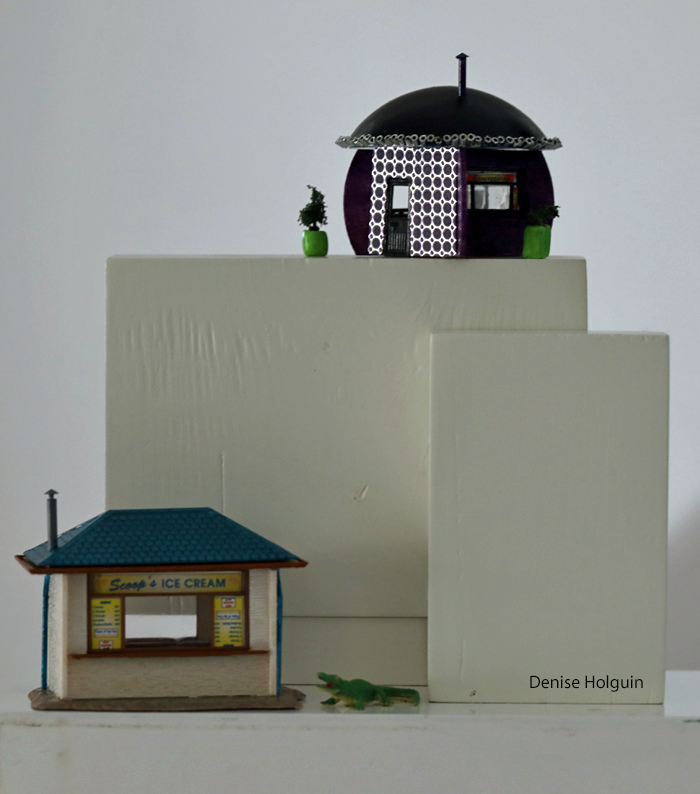 The domed roof kiosk features purple polka dot Duck Tape and silver beads on the edge of the roof. It was inspired by the avant garde Bishop Arts District in Dallas. The building below will eventually be updated with custom signs and prices for today’s market. I can’t stay in business with 10 cent scoops of ice cream. 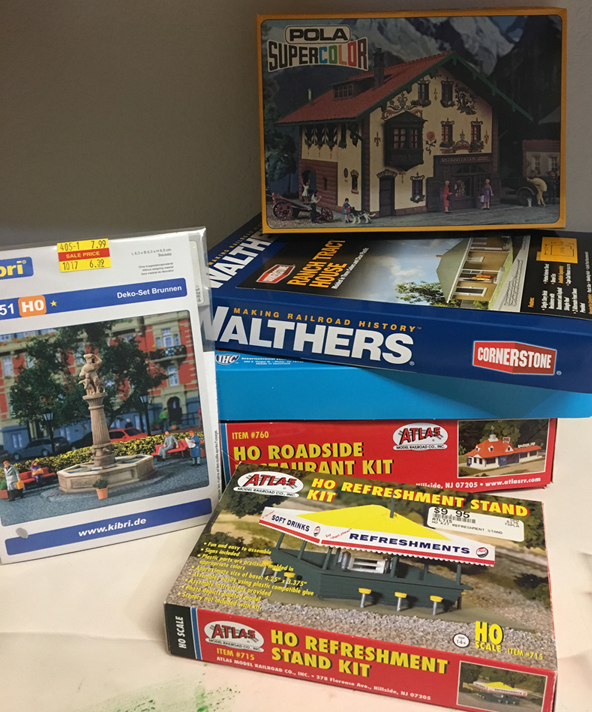 Then I bought some very affordable pre-owned buildings and started remodeling them. This building was $10.00. I disassembled it to switch the bottom walls. (Originally, the door with the tan brick was attached to the other panel.) I wanted all the tan brick on one side of the building. Below is a very rough display of the progress on the building. 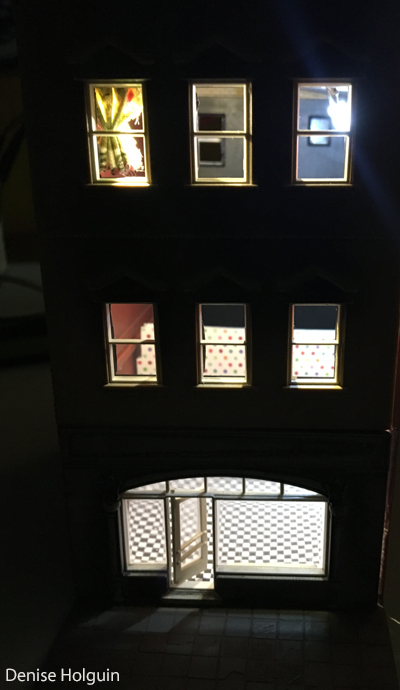 I added a fabric curtain to the top window. There’s black and white checkered flooring and polka dot walls. I have contracted with Tore Electric Company to provide LED lighting. (I used a flashlight in the photo). 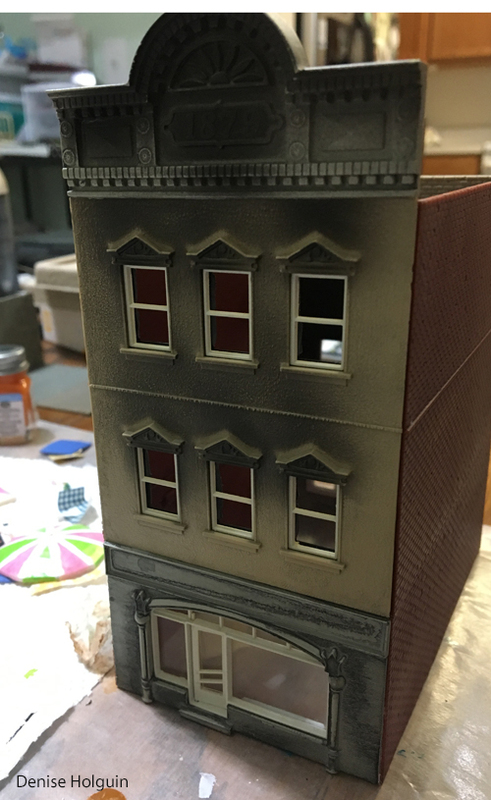 Lots more work on this building to come! 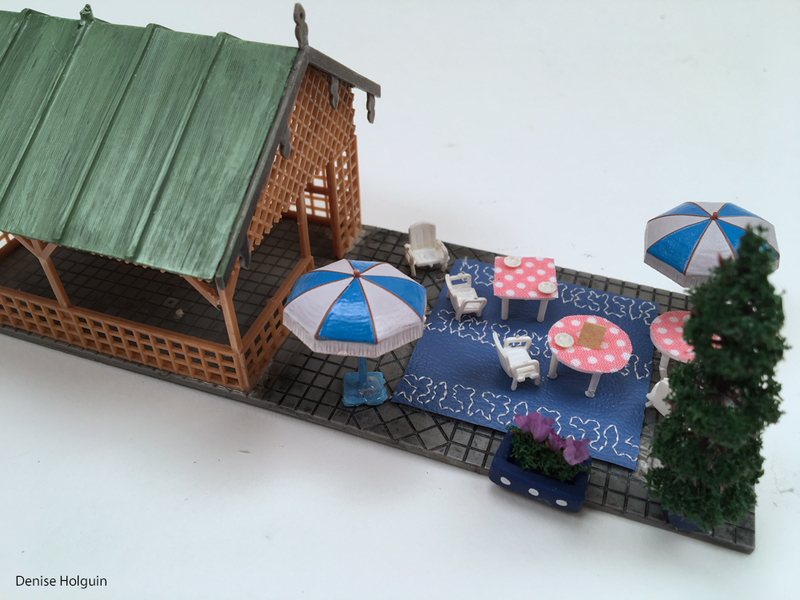 The structure below was only $8.00 and included furniture (two unpainted umbrellas, chairs and tables. The roof was black. The tables originally had blue checkered paper for tablecloths. I carefully cleaned and managed to remove all the very glued down furniture. 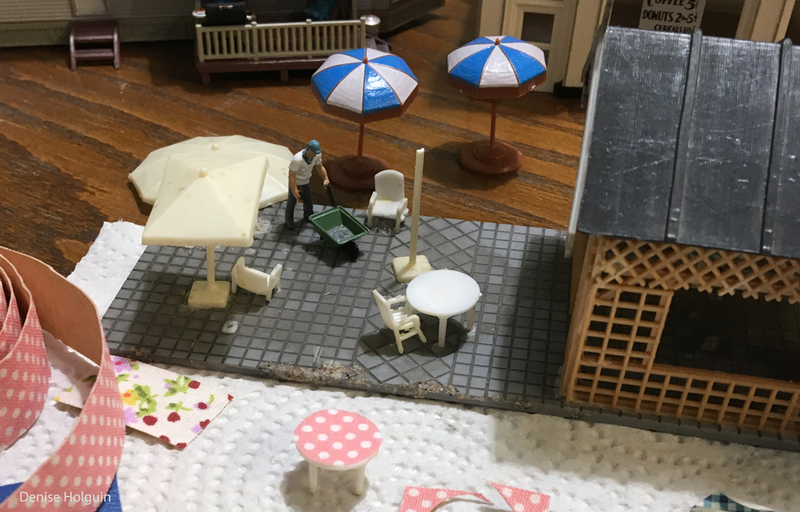 The current white/unpainted umbrellas were too large for the scale. I replaced them with the two painted ones in the background. Here’s a look of the “After” still in progress. I painted the roof green. I used the Baby Lock Ellageo’s sewing feature to make a stippled vinyl outdoor rug. Polka dot fabric Washi Tape decorates the table tops. I placed dried purple flowers in a handmade clay planter. I still need to add accessories to the inside of the structure. I like to think the original owner of the structure would be pleased with the transition. They say you can’t put a price on happiness. But looking at the fountain kit, happiness is under 7 dollars. The refreshment stand was 10 dollars but will be hours of joy. The Ranch Tract House has resulted in quite a bit of observation through neighborhoods to find just the right brick color. I suspect model kit building is much like other hobbies. You keep buying with the plan that someday you’ll make something. 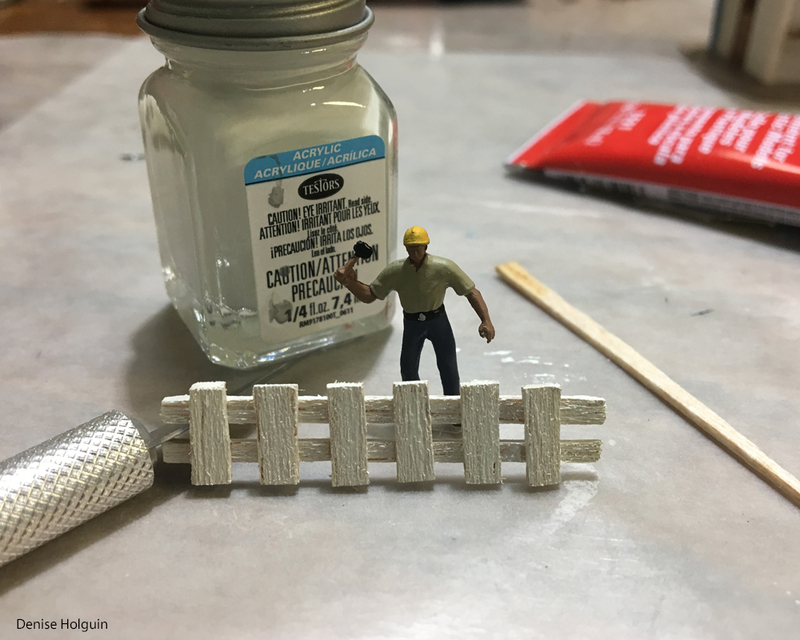 On a whim I purchased a piece of balsa wood to see what I could do. 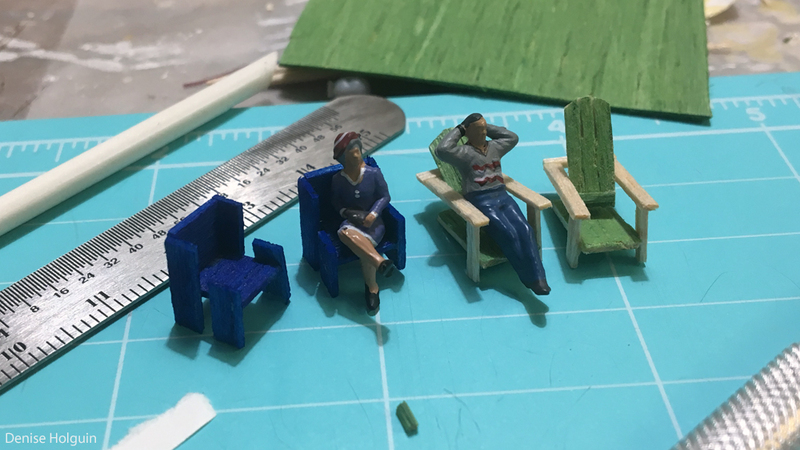 I started making HO scale chairs. 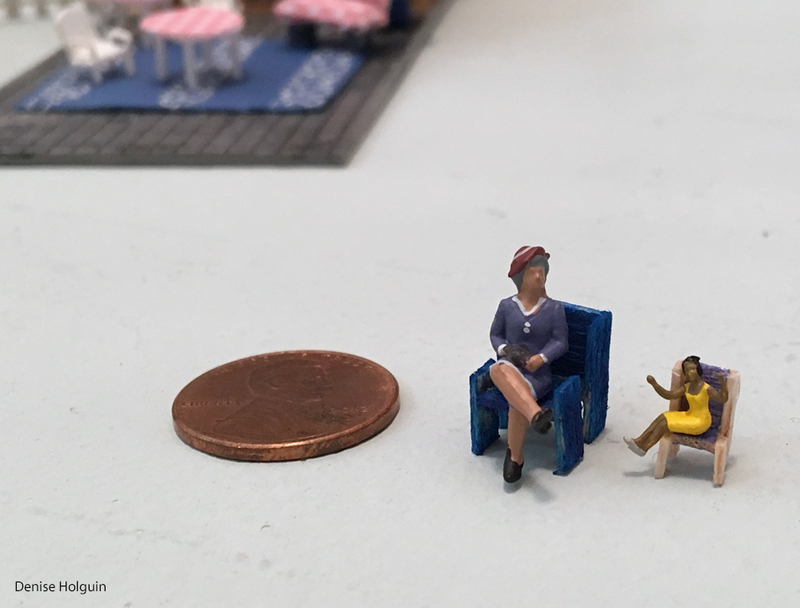 I accidentally made an N scale chair. 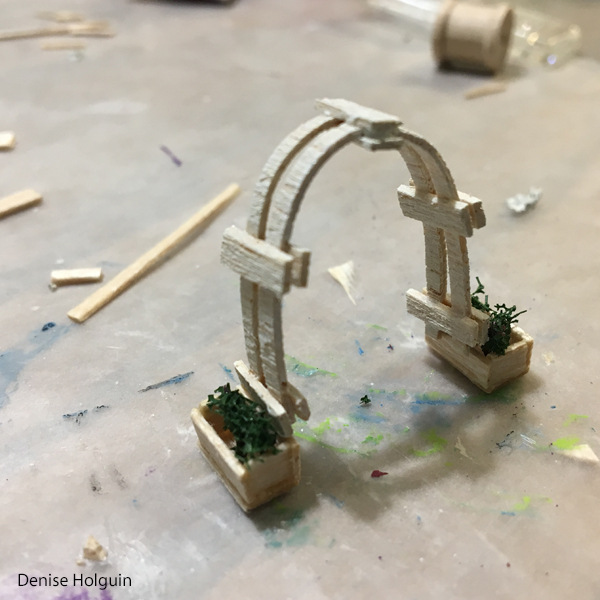 I noticed balsa wood can curve and with water it can be coaxed to curve even more. I very carefully made an arbor. The photo below shows the work in progress. The final version is painted white. 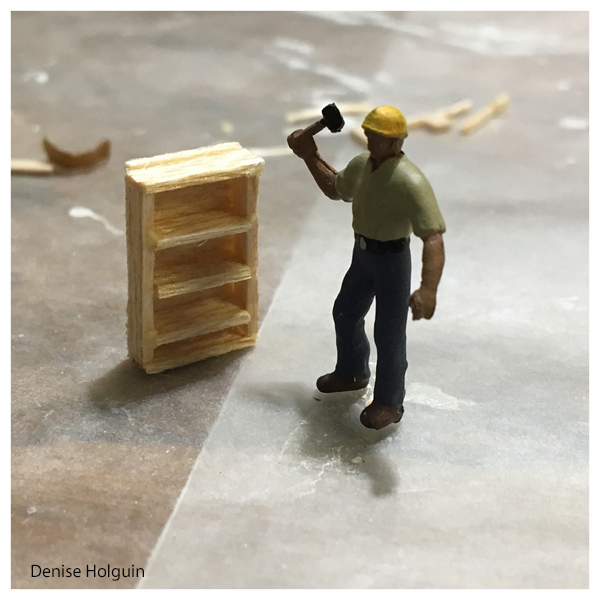 Balsa wood bookshelves for my buildings and homes. I will have a hardware store in my town where white picket fences can be purchased. Additional fence styles are forthcoming. More chairs. These are painted silver. This style uses toothpicks because I wanted the tapered point for the seat back. My friend Tore suggested I make an Adirondack chair. I had two finished chairs by the next morning. The back support is adjustable. Lots and lots of chairs in my town! As you might have guessed, this will be an ongoing series and my skills will improve over time. Notes: Once the town is complete I’ll take better photos. This blog was just meant to highlight a new hobby. This is wonderful. 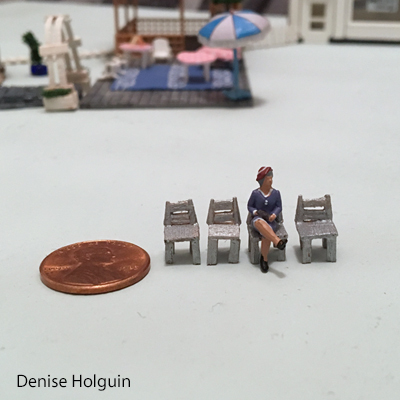 I have always liked miniatures. You are doing a great job on this. Thank you, Aunt Jennifer! You should give it a try! Previous Previous post: What motivates you, Pamela?